We explore the general astrobiological significance of F-type main-sequence stars with masses between 1.2 and 1.5 Msun. The Tawani Antarctic Expedition group photo, taken just before we started taking down the tents at Lake Obersee. Tomorrow and Monday we say goodbye to Cape Town and start our journeys back to USA, Austria and Russia. To date, scientists have confirmed the existence of more than 900 exoplanets circulating outside our solar system. Halomonas are a hardy breed of bacteria. They can withstand heat, high salinity, low oxygen, utter darkness and pressures that would kill most other organisms. The Everest tracked vehicle is here with a nice large sled in the back and a cabin attached. 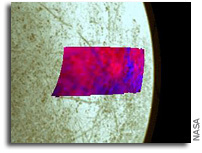 In November and December 2012 the Hubble Space Telescope maged Europa's ultraviolet emissions in the search for vapor plume activity. We have completed our work here at Lake Obersee, accomplishing most all of our objectives despite a late start due to stormy weather. About 65 million years ago, an asteroid or comet crashed into a shallow sea near what is now the Yucatan Peninsula of Mexico. In light of today's announcement that Europa is likely spouting its vaporized ocean water into space, The Planetary Society calls on the White House and Congress to approve a new mission to explore this enigmatic moon of Jupiter to better understand its potential to support life. A new analysis of data from Galileo has revealed clay-type minerals at the surface Europa that appear to have been delivered by a spectacular collision with an asteroid or comet. Hubble has observed water vapor above the frigid south polar region of Jupiter's moon Europa, providing the first strong evidence of water plumes erupting off the moon's surface. The dissipation of the tidal energy deposited on eccentric planets may induce a heating of the planet that affects its atmospheric thermal structure. Astrochemistry is a discipline that studies physico-chemical processes in astrophysical environments. We review the state of the field of terrestrial planet formation with the goal of understanding the formation of the inner Solar System and low-mass exoplanets. Earth's volatile elements (H, C, and N) are essential to maintaining habitable conditions for metazoans and simpler life forms. The habitable zone (HZ) around a star is typically defined as the region where a rocky planet can maintain liquid water on its surface. Cosmic rays may be linked to the formation of volatiles necessary for prebiotic chemistry. We present the results of simulations on the detectability of O2 in the atmosphere of Earth twins around nearby low mass stars using high resolution transmission spectroscopy. We present narrow-band photometric measurements of the exoplanet GJ 1214b using the 10.4 m Gran Telescopio Canarias (GTC) and the OSIRIS instrument. We study the masses and radii of 60 exoplanets smaller than 4 Earth radii with orbital periods shorter than 100 days. Context: The dusty debris disk around the ~20 Myr old main-sequence A-star beta Pic is known to contain gas. Using the powerful eye of NASA's Hubble Space Telescope, two teams of scientists have found faint signatures of water in the atmospheres of five distant planets. The future biosphere on Earth (as with its past) will be made up predominantly of unicellular microorganisms. We made the first dives beneath the thick, perennial ice (3.6 m) of Lake Obersee yesterday.